Quality | Excellence in design + innovation. For more than four decades, Somfy engineers have designed solutions for both the residential and commercial markets to motorise exterior window coverings such as folding arm awnings, retractable roofs, drop rollers, venetians & shutters as well as internal blinds and curtains. Somfy European built motorisation is available for our complete Weinor range throughout Australia and NZ. Contact one of our experts for assistance. Outdoor Living | Extend your time and enjoyment outdoors. Somfy motors controlling our range of outdoor awnings & roofs run efficiently and quietly. With the simple press of a button, your motorised awning will extend or retract to suit the day or evening weather conditions. With motorised Weinor awnings, you will also reduce risks of extended exposure to sunlight. Your deck, balcony or patio becomes a welcome retreat year round. Motor Quality | Cutting edge design + innovation. The Somfy motors in our Weinor awnings and roofs are tested and inspected following the most rigorous criteria to guarantee quality, performance and longevity. 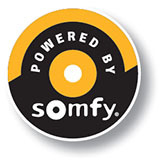 Somfy is known for having one of the strictest home automation safety standards in the world. Our range of motorised awnings can be tracked with our innovative radio technology to add a touch of brilliance to your home. As soon as the first product is installed, anything can be changed or upgraded – like adding an extra remote control or centralising any of your automated awnings & roofs with our other Somfy controllers & sensors. Motor with integrated radio control. A classic multi-purpose unit to motorise a host of products (roller shutters, awnings, vertical blinds, etc.) Up, down and stop functions, and can be preprogrammed with “my” favourite position. The proofed radio electronic motor, which protects your cassette awning for years. With one single remote control, drive any RTS device in the terrace or house. solutions for awnings + pergolas.